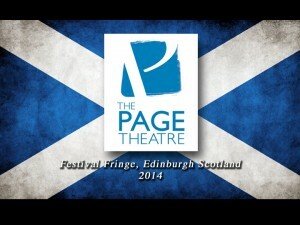 The Page Theatre is going to the Edinburgh Festival Fringe 2014! We are a registered not-for-profit society and do not receive any funding or grants. In order to pay for performing in the EdFringe, as with all of our productions, it comes straight out of our own pockets. The cost of taking a show to the Edinburgh Festival Fringe is…well, a lot! There are flights, accommodation and venue rentals. There are royalties, tech people and advertising. There are registration fees, printing and sets. There are costumes, marketing materials and liability insurance. There are many costs, but well worth every penny! We estimate the total to be approximately $10,000. That’s about 670 pads of Post It Notes or 67,000 sheets of Post It Notes! That’s a lot of notes to write! You can see why we need some help! We are passionate about theatre and are excited to show Scotland and the World what Canada’s West Coast theatre scene is all about! So if you would like to help us along, we would be eternally grateful! The Page Theatre has an amazing campaign on Indiegogo with some pretty special gifts for you! There is something for everyone! Check out our awesome video and take a look at the pretty cool perks we have for you! Shout, scream, yell it from the rooftops! Write a status update on your Facebook page! ‘Like’ us on our Facebook page! Follow us on Twitter! Go to our Indiegogo page and share it! Twitter about our campaign! Tell your friends! Come out and see our show in Vancouver in July! We truly appreciate all of your support! Theatre is passion, beautiful and alive. Let us bring your theatre spirit to Scotland!